Our inventory has really begun to increase, mainly in the condo sector of the real estate market. 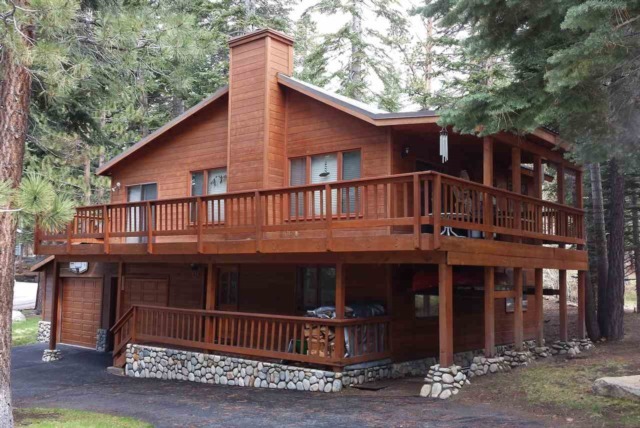 As of today, June 30, 2015, we have 201 condos, 69 homes, and 53 vacant land listings in Mammoth Lakes. Activity is beginning to pick up with increased website traffic, inquiries, showing appointment requests, and offers being presented. This is customary for this time of year, and we should really see an increase in the number of pending sales (currently at only 50 for all property types in Mammoth) in the coming weeks. There is a great selection of properties currently available on the market, but this mainly applies to condos and townhomes. The single-family home sector of the Mammoth real estate market is still somewhat limited, or it is evident that sellers are listing their properties higher and higher. Will buyers be willing to pay the higher prices over the summer season? This will be interesting to see and I will provide a recap of the single-family home sales at the end of this summer. In the meantime, take a look at what Tom DiChristopher of CNBC's Realty Check has to say about the real estate market in general. In reviewing the sales for the first half of this year vs. first half of 2014, there isn’t too much of a change in the total volume, number of closed sales, etc. The total sales volume of $85,243,141 for the first half of 2015 consists of 170 total property sales as follows: 117 condos, 47 homes and 6 lots. The total sales volume of $89,847,285 for the first half of 2014 consisted of 192 total property sales as follows: 122 condos, 56 homes and 14 lots. 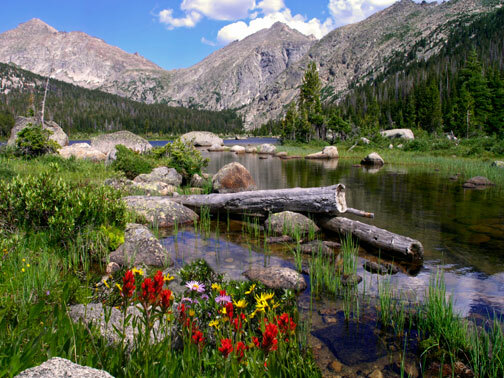 Although the skiing conditions were not the best and the media hype on the record-breaking drought has made for a quiet spring, the activity in the first quarter of 2015 was strong enough to compensate for the lack of sales during the 2nd quarter of 2015, which is why the numbers are similar for 2014 and 2015. However, sales were down approximately 30% last year vs. 2013. What Mammoth needs is a great run of winters with normal to above normal snow accumulation, which will not only benefit and improve the local economy and real estate market, but obviously, will be a much-needed relief for California and the precarious water shortage we are currently experiencing. Coming Soon to Market: 203 Valley Vista Drive, 4 bedrooms, 3 baths, attached 2-car garage with approximately 2800 SF | $1,299,000. Enjoy 180-degree views of the Sherwins and Mammoth Rock, as well as west-facing views of Mammoth Mountain ski area from this completely remodeled home close to Eagle Express in one of the Mammoth’s most desirable neighborhoods. This highly upgraded home is flooded with sunshine and features four bedrooms, 3 baths and attached 2-car garage. Two of the four bedrooms are master suites, and the comfortable floor plan offers two separate living spaces, one of which has been customized as a media room with sound-proofing, cork flooring, surround sound, and bar with Quartz and Copper counters. Some of the many upgrades include: Hydronic heating in floors, “Smart Home” with remote-controlled access to heating system, Venetian plaster, recessed lighting, custom Travertine and wide plank hand-hewn Oak flooring throughout, solid-core pine doors, custom cabinetry in kitchen with Limestone counters and built-in Miele, Sub-Zero and Viking stainless steel appliances, and so much more! Attention to detail and quality of interior finish work is consistent with what you would find in a multi-million dollar home. Must see to appreciate. Remodel by Brian Burns Construction and Corinne Brown, ASID Interior Design. Sold fully furnished with minor exclusions. Will be listing on July 1st, 2015. 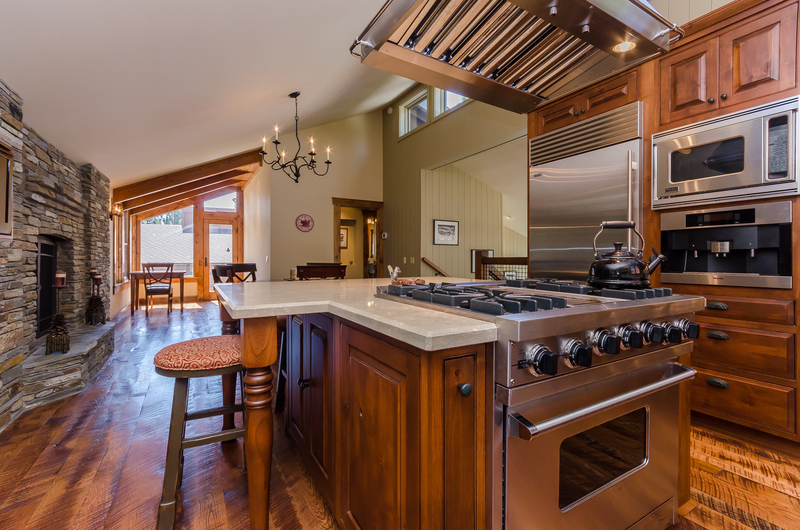 714 Majestic Pines Drive | $1,575,000: Located in the Mammoth Vista II Subdivision, and very close to the Eagle Express chair lift, this gorgeous custom log home was built in 2013 and has 4 bedrooms and a loft, 5 baths, an attached 3-car garage, 3,958 SF, and is situated on a .17-acre lot. This impressive log home was hand-crafted by North American Log Crafters out of British Columbia and provides spectacular views of the Sherwin Mountains with great southeast exposure, sunshine, and light. Some of the many features include: Huge windows in the living room, dining and loft areas, hardwood teak floors in great room, alder custom cabinets, granite countertops, and a beautiful stone fireplace. Each bedroom has its own attached bathroom. There is Hydronic heating throughout with master and individual thermostats and a security system. This home is a “must see” as the photos do not capture the quality of construction and attention to details throughout the home, which can only be seen when touring the home. This home is being sold fully furnished and turn-key! 119 St. Anton Circle in the Mammoth Knolls | $649,000: Located just a “stone’s throw” from the Village at Mammoth (3-5 minute walk from your front door) and close to ski back trail, biking trails, snowmobiling access and the Town community tennis courts, the location is just unbeatable. This well-maintained and cared for home (built in 1988) has 4 bedrooms, 3.5 baths, and attached 2-car garage, with 1,844 square feet of living space. There is a large wrap-around deck with a spa, which is also a wonderful outdoor entertaining area in the summer months. Nestled in the trees on a great lot, this home won’t last long. Sold furnished and turn-key. Mammoth Ski & Racquet Unit G71, 2 bedrooms and a loft, 2.5 baths | $339,000: This spacious and upgraded condo at Mammoth Ski & Racquet is competitively priced for condos located in the Canyon Lodge area for this size and floor plan. Mammoth Ski & Racquet is a full-amenity, and pet-friendly complex located at the base of Canyon ski lodge with several resort amenities: Tennis courts, swimming pool, spas, saunas, recreation room with pool table, multiple barbecue areas, access to mountain-biking trails, and ski back trail offers ski in convenience to your condo. The condo’s remodeled kitchen and baths have granite counters, newer vanities, plumbing fixtures, and tile flooring. The propane gas log fireplace is compliant with Town of Mammoth Lakes code, which means the new owner will not have to go through any hassles or huge expense to bring the fireplace or chimney flue into compliance. This unit features a remote controlled thermostat via the internet (adjust heating before you arrive), great views of Mammoth Mountain ski runs from your deck, four large lockers to store your skis, snowboards and toys, dry sauna right outside your door, common area assigned garage parking for one car. Sold fully furnished and turn-key, ready to enjoy! 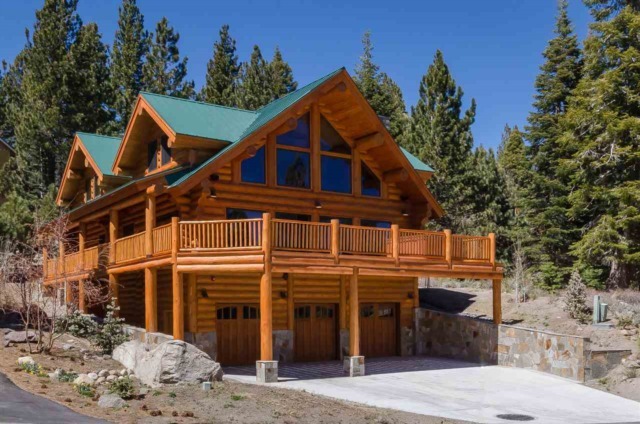 For questions regarding any Mammoth Lakes real estate listings or to schedule a property showing, contact me anytime!